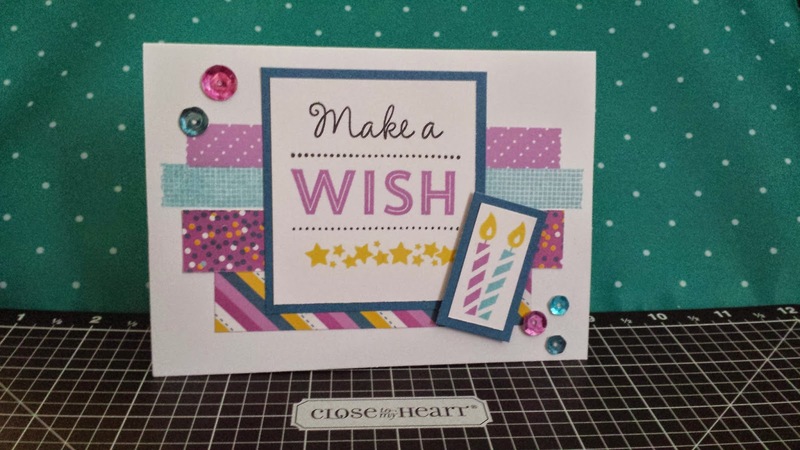 This months challenge is using the Confetti Wishes Paper Pack, brought to you from the Annual Inspirations, hand picked from Nancy Klein. I would like to share with you 3 cards I made using the Confetti Wishes Paper Pack. 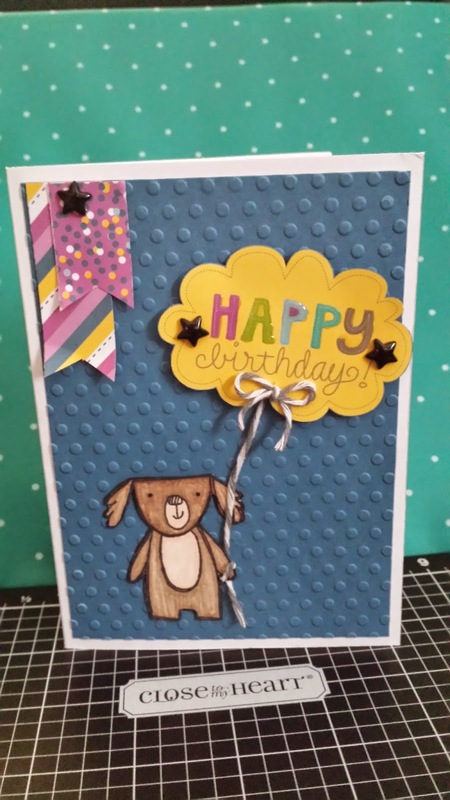 The first card is a card using the pattern and stamps from the new Blossom Cardmaking Kit. I used Canary, Crystal Blue, Thistle and Black Ink for the stamping. I used Pacific cardstock to mat the stamped images. I colored some sequins using Shinhan markers. I love this the stamp set from this kit and will be using it often. 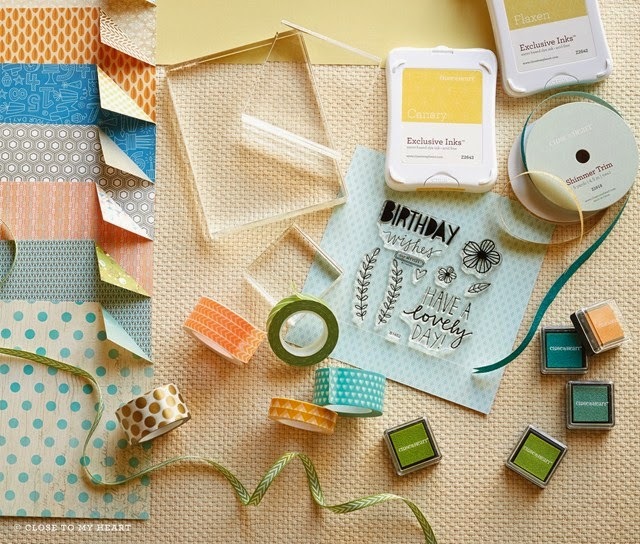 The new Blossom Cardmaking Kit is available to purchase starting April 1st, it is from Seasonal Expressions 2. The second card is another Birthday card and it also features a new stamp set from Seasonal Expressions 2. The stamp set is Friendly Pets, I stamped the dog and then colored him in using Shinhan markers. 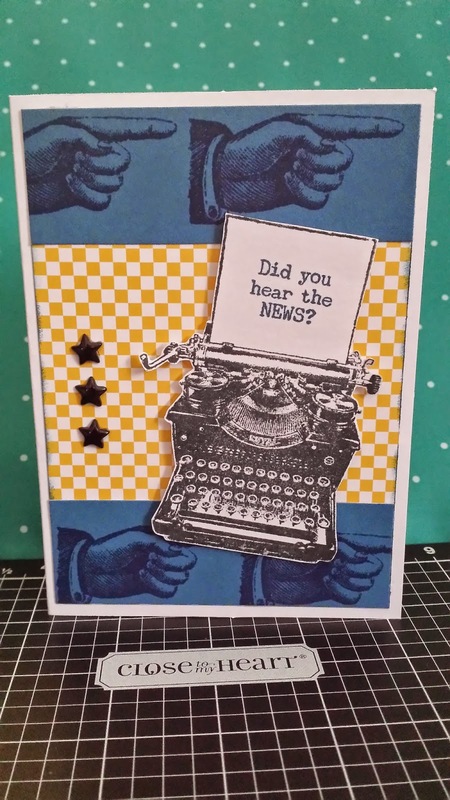 I used the polka dot embossing folder to add texture to the Pacifica cardstock in the background. I used liquid glass on the Happy Birthday to add definition and then added the stars as one of my little guys decided to come look with his fingers while it was still wet. Finally the last card features some of the stamps from the April Stamp of the Month. I love how vintage this stamp set is and the versatility of it. Can see myself using this one lots too, especially for little notes or masculine cards. I inked the edges of the checkered paper with Pacifica ink. The finger image and sentiment were stamped with Pacifica ink as well. The typewriter was stamped in Black Archival ink and then fussy cut out and adhered using foam tape to add dimension. The stamp of the month for April is Typed Note and with a $50 qualifying order it can be yours for $5. This stamp is available for the month of April only and can be purchased for $19.75 if you don't have a $50 order. Love a great deal? How about 30 days of great deals? 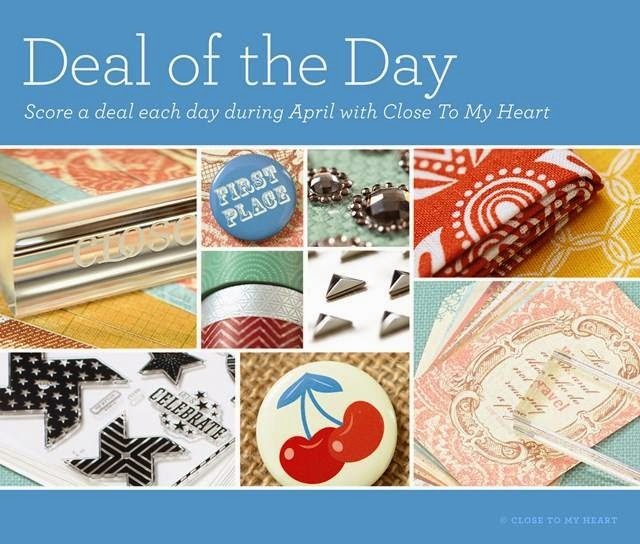 During the month of April, you have the opportunity to score a deal every day with Close To My Heart! What deals are we talking about? Each day during April, while supplies last, we’ll feature a random grab bag filled with current and retired Close To My Heart products available for purchase at a major discount. To grab your bag, simply place any current, full-priced item in your online shopping cart through my Online Business Address and you will then be eligible to purchase as many grab bags as you wish (while supplies last)! Grab bags will be featured at five different price points throughout the month, ranging from $55 CAD to $160 CAD. Some grab bags will contain product with more than DOUBLE the retail value of the price you pay! Grab bags will be available for 24 hours starting at 3 pm MDT each day and only while supplies last—so visit often and early! Remember that grab bag tiers will be featured on a random schedule throughout the month, so seize the opportunity to purchase from the grab bag tier you’re interested in when it becomes available because it might not come around again! You can check it out the deals starting April 1 at 3 pm MDT on my OBA. I am having an open house on April 11 from 1 pm to 3 pm at 9215-110 Avenue, Edmonton. I will have a make and take, upcoming class samples, snacks, and a door prize. For every person you bring to the open house you will get an additional entry into the door prize. For every $25 you order you can get an entry into the door prize. Come see some of the new CTMH stuff from Seasonal Expressions 2. I would love to have you join me for some fun. 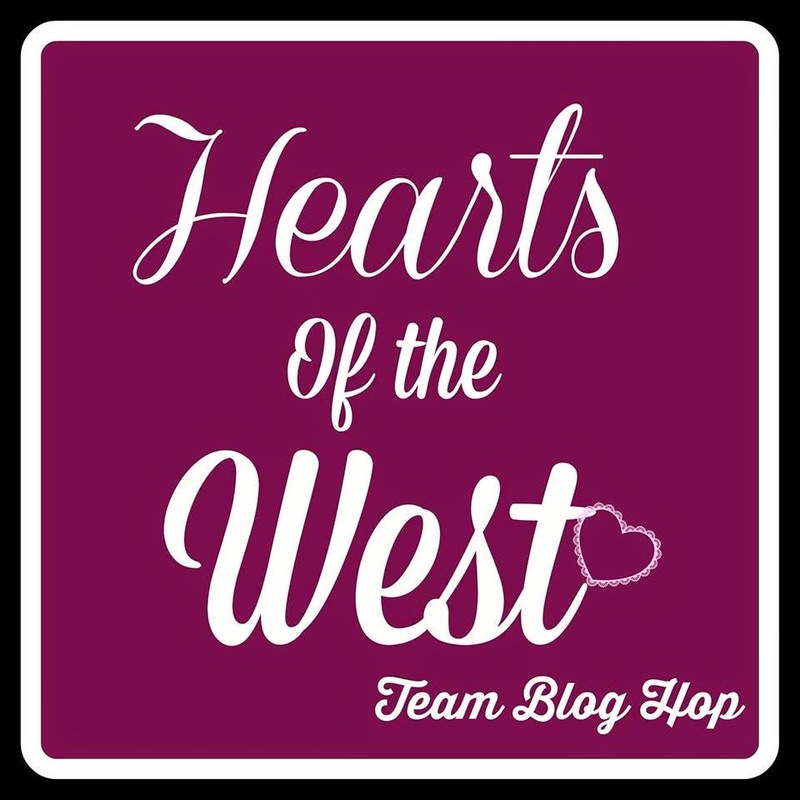 Your next stop is Valerie's Blog and it is her Birthday today so please wish her a Happy Birthday. I haven't used the sequins yet, but finally ordered some. I like the idea of colouring them to match the paper!! That dotted embossing folder really sets off that stamp set!! Kimberly I love seeing that first card design with a different set of papers! So cute with the puppy card! lovely cute cards!!! lots of inspiration!! i really love the whole set. It is super fun!! I love the dog. Very cute. i love the puppy too! beautiful cards! Great cards Kim - thank you for sharing!